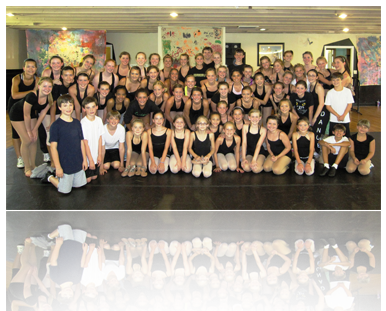 The Fusion Dance Workshop is unparalleled in dance education for young students! Designed to MOTIVATE, STRENGTHEN, TEAM BUILD, and EXCITE STUDENTS ABOUT WORKING ON TECHNIQUE AND PERFORMANCE, the workshop takes place directly in your studio, deleting the hassles of overcrowded ballrooms and travel expenses. Each workshop is custom designed by you, the studio owner, maximizing the learning experience for your students! Personalization of learning and technique are two of the main focuses of this intensive. Workshops are offered in one, two, and five-day formats for all levels of students. Technique classes in Jazz, Ballet and Modern are offered as well as specialty classes and seminars including: Tap, Hip Hop, Lyrical, Stretch, Turns and Leaps, Choreography/Improvisation, Injury Prevention and Nutrition. The intensive culminates with an informal showing for friends and family during which the dancers will perform the class combinations they have learned over the course of the workshop. Keeping this workshop affordable for everyone is important to Fusion Dance. Pricing and more detailed information is available from the link below. Please feel free to contact us with any questions you may have. We are excited to work with you and your students!